Clifford Adams will take charge of Ballyclare Comrades. Ballyclare Comrades are bringing in an entirely new management team following the resignation of Stephen Hughes - but there is no dissention at Dixon Park. Away back in August, Hughes told chairman Trevor McCann that he wished to spend more time with his family, and advised him to be on the lookout for a replacement, so now in comes Clifford Adams the current Wakehurst supremo. 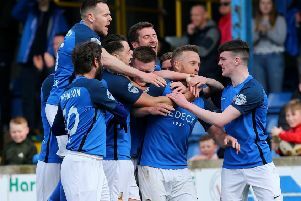 He and his assistant David Chisholm, the former Linfield coach, will be at Riverside Stadium for Saturday’s top of the table clash with Institute, before facing a baptism of fire when they take over the reins against runaway leaders Warrenpoint a week later at Dixon Park. “Stephen Hughes is a fully qualified coach who has done a marvellous job at Dixon Park,” stated McCann. “After joining us from Chimney Corner he proved himself a winner with the Reserves, when he won the Ballymena Junior League Division 1 with a team of teenagers. Since taking over the senior side, he transformed the team from relegation strugglers to promotion candidates, so I can’t speak highly enough of him, but we are not losing him entirely. He will now concentrate on coaching the younger players, and hopefully will keep the conveyor belt well stocked. “We appreciate Stephen wanting to step down in mid-season in order to give the new man time to assess the existing squad, and make plans for the new season. “He hands over a side sitting second in the table, with eyes firmly fixed on a possible promotion play-off, so it is an exciting time for our faithful fans. “Clifford Adams, after having been in charge of Ballymena United Reserves during the reign of Glenn Ferguson, before switching to Wakehurst, has wide contacts throughout the football fraternity, and we are hoping that he will bring in new talent for next season. “Since taking over at Wakehurst at the beginning of the season, he has turned the club around in a few months, and he leaves them sitting in second spot in the Ballymena Intermediate League table, so we hope that he brings the Midas touch to Dixon Park,” he enthused. Reflecting on his time at the helm, Stephen Hughes said: “Ballyclare Comrades is a very homely club, and I have greatly enjoyed my three and a half years at Dixon Park, but a recent addition to my family means that I intend to cut back on my football commitments. “Manager of the Comrades was a 24/7 job, so stepping down to concentrate on coaching the younger players will give me the time I need with my family. “In recent months, I have kept the chairman Trevor McCann fully informed of my intentions, and I am pleased that he has been able to recruit a mid-season replacement. “I consider it an honour to have been manager of a top club in the second tier of the Northern Ireland football hierarchy, and it with much regret that I find it necessary to relinquish my position. “Thankfully we were able to hold on to all our players during the January transfer window, and I was delighted to end the recent run of defeats before bowing out, and with the Reserves sitting in pole position in their league, the future looks bright under a new management team, and I wish them every success,” he added.